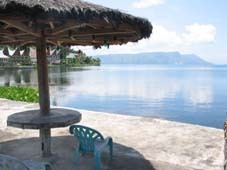 Bagus Bay Homestay and Restaurant Traditioanal Batak houses that are clean and comfortable with a great view out to the lake. There is great swimming right in front of the Bagus Bay property and the ferry will drop you off and pick you up from their jetty. Wednesday and Saturday night at 8pm they have traditional Batak dancing and folk songs free of charge in the restaurant. Their great restaurant has a great selection of Indonesian food and Western food including homemade yoghurt, ice cream, pizzas, great bread, pies and lasagna. Nightly they show DVD's in the bar usually at 5pm and 7.30pm. 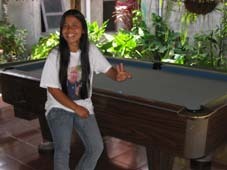 At other times you can select a DVD to watch at your leisure and they have a pool table. Internet access is available at 20,000Rp per hour. Email: contact via above website - the email listed on their webpage bagus-bay@hotmail is not working though they have a contact page to submit requests. Stayed at Bagus Bay in December last year, friendly staff, great food and the dancing on Wednesday was fun.Will be back for sure at this great place with great views. 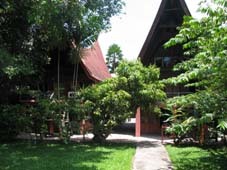 I've stayed a few times at Bagus Bay and is really cool place to stay. The restaurant is awesome with a great selection of Indonesian and western food. Free DVDs shown most nights and really good swimming right at the front.